Toyota is planning a sales lift for its Kluger SUV with the release of a value-packed Altitude special edition. Features worth more than $9,000 have been added to make the Kluger Altitude, which is available in two-wheel drive from $44,490* or all-wheel drive from $48,990*. Satellite navigation, a rear entertainment system and a tilt-and-slide moonroof are the key additional features in the package, which adds just $1,300 to the price of the seven-seat Kluger KX-R on which it is based, for both the two-wheel drive and all-wheel drive version. Kluger Altitude is instantly recognisable, with the KX-R's alloys upgraded from a 17-inch combination to the 19-inch rims and 245/55 tyres usually reserved for the top-grade Grande variants. Other external enhancements include black roof rails, front foglamps and an Altitude badge on the tailgate. Toyota has refined the interior with a premium AVN (Audio, Visual, Navigation) system that incorporates satellite navigation with traffic updates (where available) and 3D images viewed through a 6.1-inch LCD touch screen. The upgraded audio system includes Bluetooth™ for hands-free communication, streaming for compatible smart phones or MP3s, phonebook and SMS message access, voice recognition, SMS text to voice, SD Card Slot, USB input and iPod® control (check if device is compatible). Rear-seat passengers will be entertained with the inclusion of a DVD entertainment system with a nine-inch screen mounted in the roof and three wireless headsets. Kluger Altitude is offered in four exterior colours and a black fabric interior. Like the KX-R, power comes from a 3.5-litre dual VVT-i V6 petrol engine driven through a five-speed electronically controlled automatic transmission. Kluger's comprehensive safety package includes seven airbags and driver assist technologies such as vehicle stability and traction control, Hill-start Assist Control and, on the all-wheel drive version, Downhill Assist Control. Standard features include electric power-assisted steering, audio and multi-information display controls on the steering wheel, Optitron instruments and air-conditioning. Kluger Altitude has three rows of seats in a 2-3-2 configuration. The split-fold second-row seat has a removable centre seat. 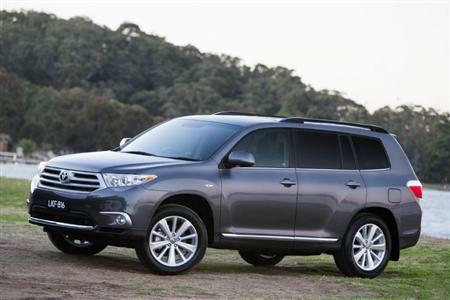 Kluger sales last year rose 13.2 per cent to 13,239 units - a stronger rate of growth than the overall market.